(Scolding his army) You incompetent ingrates! I gave my empire two simple objectives, and you've failed both! (Intrigued) Interesting. Please excuse my earlier outburst doctor. 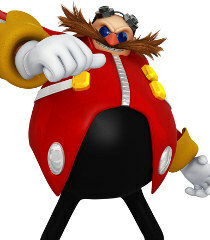 My name is Dr Eggman, and I am the greatest robotics genius on MY world. (Gloating) Wah-Ha-Ha! Congratulations, doctor! Our first Roboticized Master! Muahahahaha! Guess what, Sonic Heroes?! What did you say?! Now I'm really mad! Greeting world! Another Grand Prix is set to begin! Your host as always, Doc-er.... That's right! King Doc!